Once a month, all of the dens and family members gather for a pack meeting under the direction of a Cubmaster and pack committee. The committee includes parents of boys in the pack. Webelos. This program is for boys who have completed third grade (or are age 10). A boy may begin working on the Webelos badge as soon as he joins a Webelos den. This is the first step in his transition from the Webelos den to the Boy Scout troop. As he completes the requirements found in the Webelos Scout Book, he will work on activity badges, attend meetings led by adults, and become familiar with the Boy Scout requirements all leading to the Arrow of Light Award. Cub Scouting means "doing." Everything in Cub Scouting is designed to have the boys doing things. 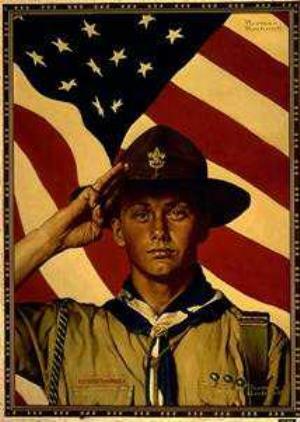 Activities are used to achieve the aims of Scouting citizenship training, character development, and personal fitness. Age-appropriate camping programs are packed with theme-oriented action that brings Tiger Cubs, Cub Scouts, and Webelos Scouts into the world of imagination. Day camping comes to the boy in neighborhoods across the country; resident camping is at least a three-day experience in which Cub Scouts and Webelos Scouts camp within a developed theme of adventure and excitement. "Cub Scout Worlds" are used by many councils to carry the world of imagination into reality with actual theme structures of castles, forts, ships, etc. Cub Scout pack members enjoy camping in local council camps and other council-approved campsites. Camping programs combine fun and excitement with doing one's best, getting along with others, and developing an appreciation for ecology and the world of the outdoors. I, (name), promise to do my best To do my duty to God and my country, To help other people, and To obey the Law of the Pack.